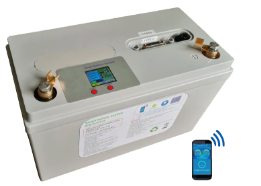 ​LiFePO4 (lithium iron phosphate) is a lithium-ion battery technology that is safe, powerful and plug compatible with most lead acid battery charging systems. This battery technology offers many advantages over lead acid technology including high capacity storage, delivery of consistent high power, longer cycle life, less weight, longer shelf life and rapid charging. LiFePO4 batteries are the safest type of Lithium batteries as they will not overheat, and even if punctured they will not catch on fire. The cathode material in LiFePO4 batteries is not hazardous, and thus poses no negative health hazards or environmental hazards. Our LiFePO4 batteries are plug compatible with lead acid batteries and will accept a charge from most lead acid configured chargers. A LiFePO4 battery has two primary components, the LiFePO cells and the Battery Management System (BMS). Both are housed in a sealed battery case. The quality of each component is key to the longevity and performance of the battery. LiFePO cells are wired in parallel to form a module producing 3.2 volts. Four of these units are connected together in series to form a rated 12.8 volt LiFePO4 battery. The temperature, charge and discharge of each cell is managed by the BMS, a computer built into each battery. A common LiFePO4 battery is rated at 100 amp hours and is roughly the size of a group 31 lead acid battery. These batteries are also rated as to their maximum discharge capacity. 100 Amps max discharge is common. We prefer a higher maximum discharge rate of 150 Amps for marine applications for both house and start power. Charge/discharge cycles - LifePO4 batteries have an expected life of 2,000-4,000 charge/discharge cycles at a discharge to 90%. Lead acid batteries have an expected life of 300-700 charge/discharge cycles at a discharge to 50%. Discharge profile - LifePO4 batteries stay at a voltage of 13 to 13.4 volts during discharge of up to a 95+%. Voltage then drops off rapidly. A lead acid battery decreases in voltage from 13 to below 12 volts as more current is drawn. This means many appliances will operate more efficiently throughout the discharge cycle using LiFePO4 batteries. Discharge rate - The BMS built into our batteries has a 100 amp or a 150 amp discharge capacity. This means the batteries can sustain a heavy discharge without damage or degradation. Our manufacturer has advised us that the quality of the cells and quality of the BMS is key to the longevity and performance of a LiFePo4 battery. We have seen this firsthand. Weight/power ratio - A typical 100 Ah LiFePO4 battery weighs about 31 pounds. A comparable lead acid battery is over twice that. Because LiFePO4 batteries can be safely be drawn down 95% vs 50%-60% for lead acid, fewer batteries are required to achieve the same power. Battery weight combined with useful power capacity means battery bank weight can be cut by more than half using LiFePO4 batteries. Also, LiFePo4 batteries will occupy up to 40% less space than equivalent lead acid batteries. ​For example, 3 group 31 110 amp hour lead acid batteries weighing a total of 200 pounds can be replaced by 2 group 31 size 100 amp hour LiFePO4 batteries weighing a total of 62 pounds. Both configurations have roughly the same power capacity because the lead acid can be safely drawn down 50% (330 amps @50% = 165 amps) and the LiFePO4 can be safely drawn down 95% (200 amps @ 95% = 190 amps). Also, the lead acid will endure 400-600 cycles and the LiFePO4 over 2,000 cycles. ​Safety - Lithium batteries have a reputation for catching fire. This is not so with LiFePO4, a very different technology. The built-in Battery Management System (BMS) monitors the state of charge of each cell group and manages the temperature, charge and discharge rates. The BMS will prevent over-charging and over-discharging by disconnecting from the source. There are no toxic chemicals or gases as in many types of lead acid batteries. The batteries can be mounted in any direction; bottom or side. Compatibility - While the optimal charging parameters vary between LiFePO4 and lead acid battery technology, the BMS built into our LiFePO4 batteries compensates for this. Thus, our LiFePO4 batteries are compatible with most lead acid battery charging systems. Battery Monitoring - Our LiFePO4 batteries are equipped with two methods of monitoring battery State of Charge (SOC). This is important because unlike lead acid batteries, LiFePO4 batteries maintain a constant voltage between 13 and 13.4 volts so a volt meter is not an accurate indicator of SOC. An LED meter is built into the top of each battery to indicate the SOC. A built in Bluetooth capability enables real time monitoring of each battery through an APP on either an Android or IOS smartphone or tablet. The APP displays the state of charge (SOC) of the battery, the amp draw and voltage level, the temperature, the time to full charge and the number of charge/discharge cycles. This capability is nearly equivalent to having a built in battery bank monitoring system like a Link 2000. Winter Operation and Storage - LiFePO4 batteries can be stored in temperatures from 0°F to +100°F (-18°C to +38°C). It is recommended they not be charged and discharged at temperature below 0°F (-18°C) . It is recommended that the negative terminals be disconnected during winter or long term storage so there is no chance of draining the batteries while in storage. LiFePO4 batteries should be recharged at a minimum every 6 months while in storage. Cost - LiFePO4 batteries are 2 to 5 times the cost of comparable lead acid type batteries. Cost justification is often based on convenience, performance and longevity. Factors to consider in evaluating cost include the number of cycles, weight, charge and discharge parameters and compatibility. ​They are more expensive than lead acid however their advantages often outweigh the additional expense. These 100 Ah LiFePO4 batteries are designed for house bank applications. They have a built in 100 amp Battery Management System and are plug compatible with most lead acid charging systems. Includes built in State-of-Charge meter and Bluetooth battery monitor option with APP. These 100 Ah LiFePO4 batteries are designed for both house and start applications. They have a built in 150 amp Battery Management System (BMS) and are plug compatible with most lead acid charging systems. Includes built in State-of-Charge meter and Bluetooth battery monitor option with APP.